Bugaboo Donkey – both a single and a double pram! So have you recovered from the excitement yet? I woke up this morning with what felt like a hangover, but it was just the lack of sleep I suffered last night thanks to the Bugaboo announcement. It was amazing to get the news and then rush to tell you all about it – it sure got the heart thumping! So now it’s the day after and we’ve had a little time to digest how phenomenally innovative this pram is. We’ve never before seen a side-by-side pram that functions firstly as a single pram for your first child, then expands its frame to accommodate a second child. Now you can buy an inspired, elite brand without the worry of what to do when child number two arrives! 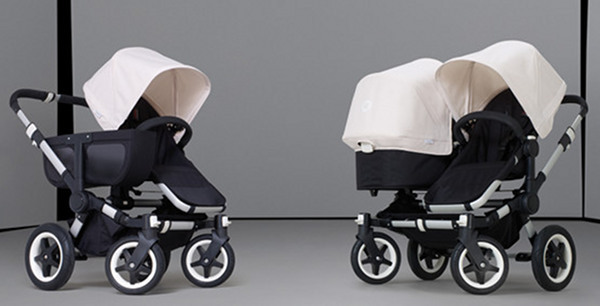 Bugaboo is also catering for families with twins for the very first time so we’re seeing every parents’ box ticked with this latest addition to the family. In single mode, the Donkey is only 60 cm wide – the same as the Cameleon – and at only 74 cm at its fullest width, it’s destined to be the narrowest luxury double on the market. In a matter of seconds the frame can be expanded to add a unique storage basket, the likes of which we’ve never seen before in either a single or double pram – haven’t we all wished for more storage space? Now you can do a sizeable grocery shop without the inevitable overloading. With the Bugaboo Donkey it really does appear you can have your cake and eat it too – buy just once and go ahead and have your family. You’ll never need to think about buying anything else! The release date for Australia will be some time in early 2012, however no word yet on price. In the meantime, check our Chooser to compare single and double prams currently on the market.